The WELD Table is the first ever work table with built-in retracting Apple chargers. You'll never again worry about bringing your chargers or running out of juice. Pack lighter and still work the whole day. The WELD table is the result of a collaboration between Klevr and WELD –Two brands that obsess with creating friction-free tools and environments to help you get things done. The WELD Table has the power and features to make you productive. Sixteen power outlets for other devices. And even tool-free assembly so you can set up in less than 5 minutes. Every piece of the WELD Table is a bespoke part designed to make the user's experience as pleasant as possible. We engineered the power strip to have no visible buttons or cords. We spaced the power outlets to accommodate any plug or power adapter. We made the cords extend smoothly and retract with just a gentle tug. We park the cable connectors so they're easy to grab. We placed the pen wells and retractable cords where they're most convenient. We rounded every edge on the desk for comfort and safety. We use an extremely high quality marker board laminate that erases cleanly and can withstand every day abuse. And we obsessed over every detail to make it aesthetically pleasing. In a nutshell, the WELD Table is a very nice place to sit and work. The tops are made from 27mm Baltic birch laminated with an incredibly high quality dry-erase marker board. There's no shiny white paint, shower board or vinyl covering used here. Both sides are laminated to keep the wood panels flat and stable over their lifetime. This means that should one side get irreparably damaged, you can easily flip the table top over and extend its lifespan. Dry erase marker board tops let you be creative in an instant. Grab a pen from the handy pen wells in the middle of the table and get drawing. Write down a phone number or shopping list without scrambling for pen and paper. Or brainstorm with a colleague without everyone in the room overlooking your work. Then record it with a quick camera phone pic and wipe the top to eliminate the evidence, all in relative privacy. 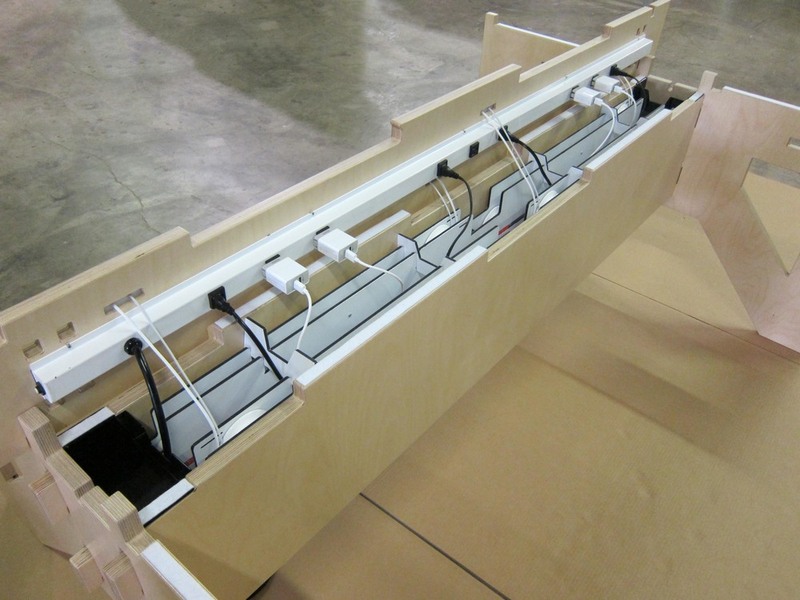 We custom-engineered a double-sided power strip to power everything both above and inside the table. There are no visible reset buttons or cords to stare at while working. The outlets are uniformly spaced to accommodate any plug or adapter. The colors are coordinated to the desktops and the WELD brand. And the WELD Table uses only a single power cord to drive everything. Don't worry about packing any power cords or adapters for your commute. The WELD Table has everything you need built right in. Working on a laptop and need power? Have a cell phone that needs recharging? Just pull up a retractable cable and plug in. Come to work without your bag weighed down with cords and adapters and still work a full day with all the juice you need. There's more power in this table than pretty much anyone needs. There are sixteen 110v outlets on top, so you could power four iMacs, eight external drives and four chargers for your drones' batteries, and you'd still have eight built-in chargers for four MacBooks and four iPhones. We custom-engineered a dual-cable retraction mechanism so that we could pack eight laptop and phone chargers with cables right into the table. Each cable has almost four feet of extension, which means that you can plug in your phone and sit back to take a call with it still plugged in. The retractors are designed to use off-the-shelf Apple MacBook adapters and iPad chargers and to be very gentle on the cords. Large diameter pulleys minimize bending of the cables, and the retraction stops early and uses gravity to settle the connector down onto the grommet, preventing damage to the connectors. Don't want Apple adapters? The retractor design is "cable agnostic" and could be configured with most any kind of cord and adapter so long as the cords are long enough – about 66" for one port and 73" for the other. Click here to read more about the engineering of the WELD Table. The WELD Table is designed to seat four power users very comfortably with lots of elbow room. The ends of the table leave just the right amount of overhang and knee space to allow a client or friend to pull up a chair comfortably to work next to you for a short while. While it doesn't have headrests playing cartoons for the kids, it does have all the cords and gadgets needed to keep everyone seated and busy. It's possible for one person to assemble a WELD Table in just a few minutes. No tools or hardware is required. In fact, the only hardware in the table is in the retractable cable assemblies, and we've already assembled them for you. Just drop in the mechanisms, plug in the cords and set the tops in place. Of course, having a friend will make the job a bit easier since some of the panels are large and heavy. But if you're strong, you can certainly do it alone in only a few minutes. ARE YOU READY TO SUPERCHARGE YOUR WORKSPACE? The WELD Table is presently build-to-order. Finished product usually ships within 30 days from date of order, barring material availability issues. Please contact us for confirmation. 50% Deposit required with order. Remaining balance plus shipping due prior to shipment. Item ships via LTL (less-than-truckload) ground freight carrier.